If you need to de-stress, you could add some cardio, try meditation — or move to Hawaii. No surprise, that's the least stressful place in the U.S. to live, according to a Gallup-Healthways survey on daily stress levels released last month. Hawaii has held this spot since Gallup started measuring daily stress in 2008. The map below shows stress levels by state, based on the percent of residents who experienced stress "yesterday" on different days during 2012. Some of the most-stressed states are located in the Northeast, where there are plenty of cities filled with their own urban stressors. 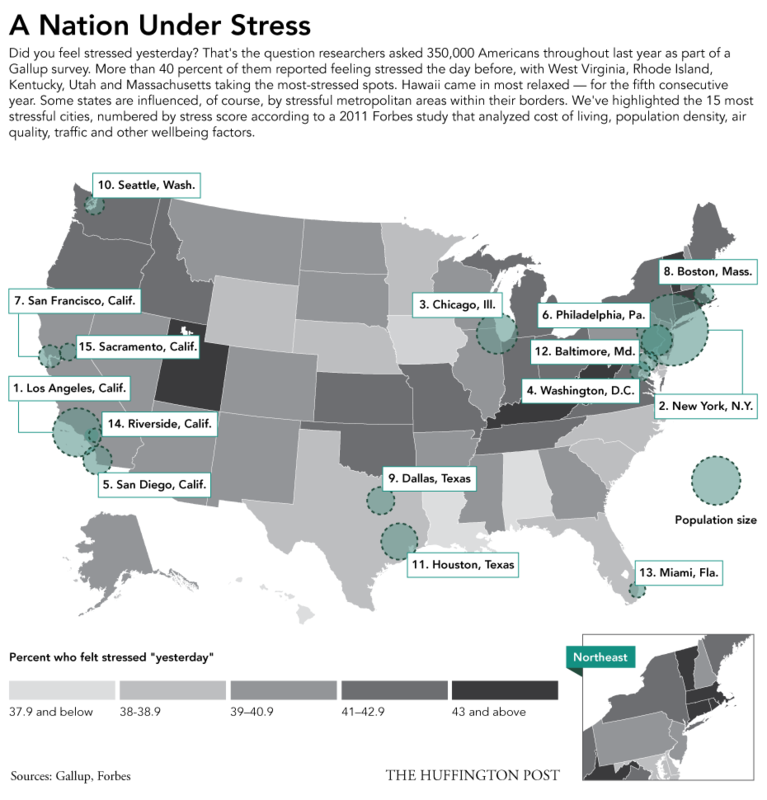 Our map also shows the nation's 15 most stressful cities, ranked by a 2011 Forbes study that analyzed data on wellbeing measures such as unemployment, cost of living, population density, traffic, air quality and more. California is home to five of these cities, but sunny weather and some of the highest numbers of per-capita yoga studios may help keep city traffic and housing costs from dragging the state down. There are countless personal and societal factors that can contribute to stress, and financial stressors are some of the most discussed. Two of the most-stressed states are West Virginia and Kentucky, where around 19 percent of people live in poverty. On the other hand, stress levels tend to be lower in the Deep South, where poverty levels are among the country's highest. This story appears in Issue 52 of our weekly iPad magazine, Huffington, in the iTunes App store, available Friday, June 7.